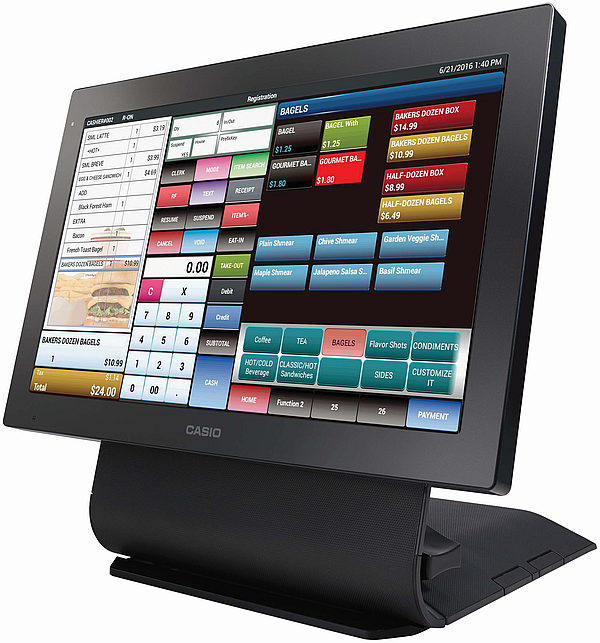 The Casio V-R200 is an all-in-one touch screen POS terminal was specifically designed for the small quick service and fast food industry, but it also has features that lend itself well to retail. It was intended to be simple and easy to use like a cash register appliance, but has advanced features such as touch screen, modifiers, scanning, integrated credit and debit, multi-register communication, and remote preparation printers, just like a quick service POS system. Designed on the Android operating system, it is extremely user friendly and low maintenance. Designed with hardware-based “Flash ROM” technology, the V-R200 has no spinning hard drives or fans. This makes it the perfect hybrid for the customer that would like the reliability and simplicity of a cash register, but the speed, expandability and features of a quick service software point of sale system. The attractive piano black design of the Casio V-R200 makes it an impressive addition to any décor. The terminal is one of the quietest POS terminals available, and perfect for noise-intolerant environments. In both retail and restaurant, space is a premium. The compact size of the V-R200 measures in at 15.5″(W) x 9.3″(D) x 9″(H), and a weight of only 11lbs (5kg), which makes it one of the smallest terminals available and perfectly sized for almost any countertop. When the store staff initiate the end of day procedure, reports can be automatically sent to one or multiple e-mail addresses in PDF format for owners or bookkeepers to review and record. This automation eliminates the need for managers to waste time running reports and ensures that the correct people are receiving the necessary report data accurately in a timely fashion. The Casio V-R200 terminal features a large 10.4 inch SVGA colour LCD with a rugged splash resistant tablet design. The viewing angle of the operator display is adjustable, enabling the operator to find the perfect angle in any lighting environment. An integrated 2-line LCD rear customer display is also adjustable in height and angle, and makes transactions transparent to the customer, and reduces error and fraud. The Casio V-R200 comes with an integrated single station thermal receipt printer, with an easy to use drop and load design for easy paper changes. The printer offers the choice of either built-in 80mm (3-1/4″) wide or 58mm (2-1/4″) wide receipt paper, and prints at a rate of 120 mm per second. The cash drawer is “Canada friendly” with plenty of space for our wider bills as well as coins, including the one dollar and two dollar Canadian coins. The cash drawer is conveniently removable so that it can be installed under the counter for stores and restaurants looking to maximize counter space and improve the look of their checkout. Capable of multi-drawer, the Casio V-R200 is equipped with two dedicated cash drawer ports. The Casio V-R200 touch screen POS consumes less power than the typical PC-based POS system, requiring only 18 watts on full power and 12 watts in stand-by mode. This is an average savings of up to 85% when compared to many PC-based point-of-sale systems. As electricity costs continue to rise, knowing your POS terminal is and cheaper to operate while reducing your impact on the environment is good business for any size store owner. The Casio V-R200 is equipped with an Ethernet communications port for connection to a network for multi-terminal communication, as well as the internet for remote communication, software updates, and emailed financial reports. In addition to the Ethernet port, the Casio V-R200 features three RS-232 serial ports, two cash drawer ports, an SD/SDHC card slot, and 1 USB port. This allows for a variety of add-on options and features, including scanning, remote kitchen or bar printers, slip printer, integrated scale, remote customer display, and integrated credit and debit with Global Payment Systems.